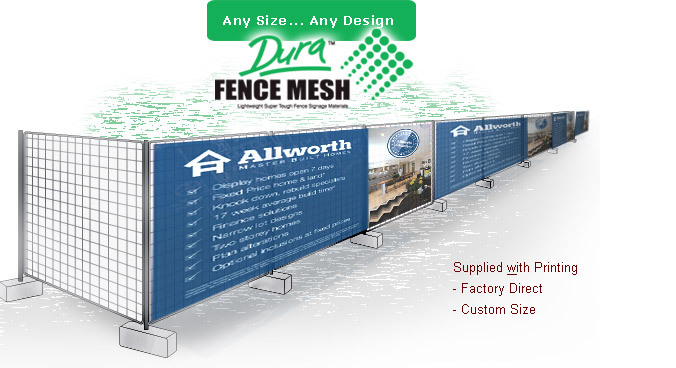 DuraFence Mesh wrap is popular for construction and building contractor local managers advertising their project and identifying the site contractor on the hoarding, scaffolding or temporary fencing rent panels. It is a strong polyester material and well suited for privacy banner signage printing vs old style pp shadecloth. 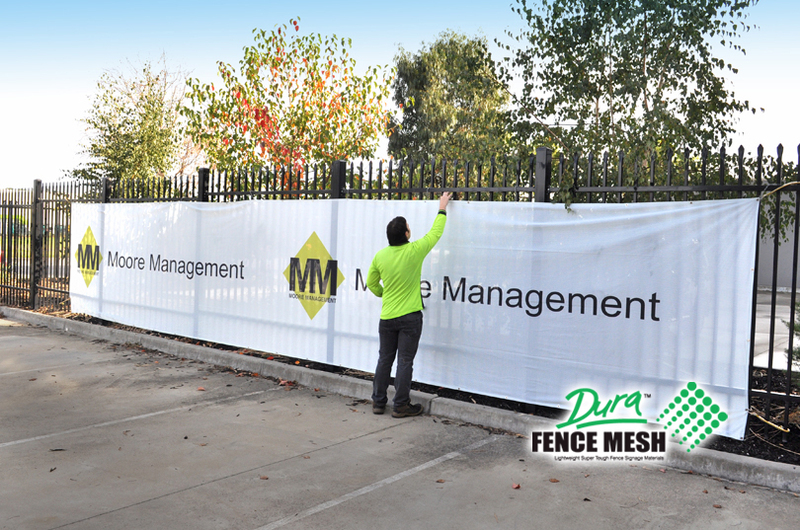 "The DBFM (DuraFence Mesh) material is a durable & medium weight fabric wrap designed with attaching to rental fencing, scaffolding and hoarding in mind. It is ideally suited for privacy screening and dust control requirements. 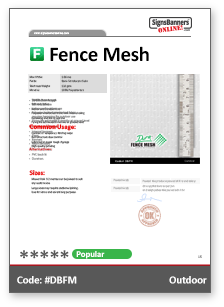 Also, screened fences may reduce insurance site costs in particular applications. 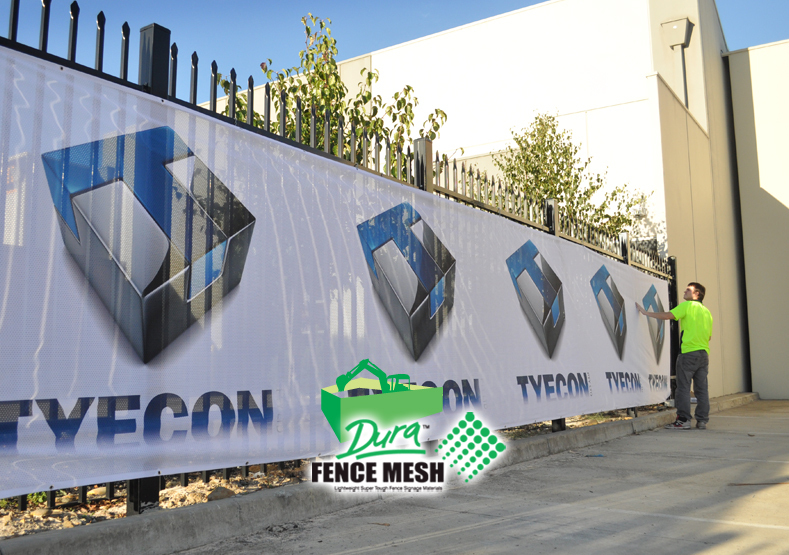 Fence mesh is a tight weave design polyfabric and is capable of full color graphics, photographic applications and logo repeats." "DBFM is popular, strong and made for securing to open wire fences, as used by builders, contractors and developers to surround screen construction sites". #1 Outdoor Life: Medium Term approx 12-18 months. #2 Minimum Order: No minimum order is required. 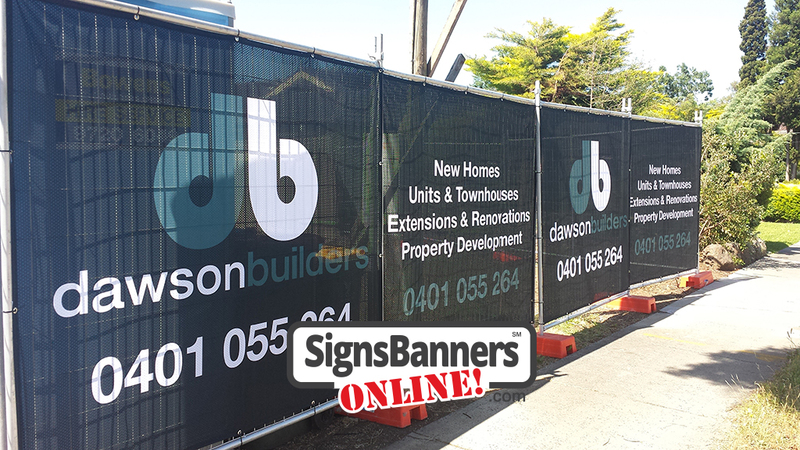 All DuraFence screen is available in custom sizes to suit your construction rental fence screen wrap, scaffolding, hoarding or site applications. Made to order printing in full color. #3 Prints and looks better than cheap shade cloth. NOTE: This product is a 'cover material only'. It is not a safety fall product. 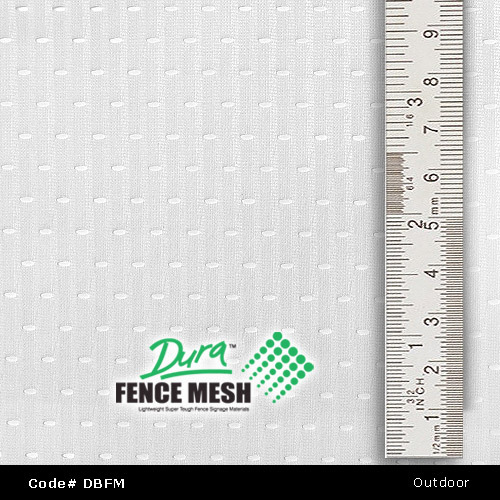 Comparison DBFM is a tensile Polyester material with 78% blockout vs PP shadecloth 42% blockout. Closer weave pattern is superior to shade cloth prints. Full color graphics, photo-graphics and client illustrations are better reproduced. Custom made sizes and lengths allow contractors to use differing artwork and site locations for each project more effectively. 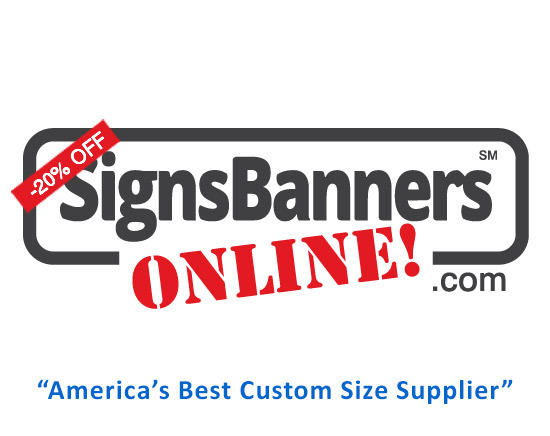 Extra Feature: DBFM banner media is engineered with a print receptive treatment and when printed it displays a wide array of vivid colors with outstanding color consistency. #1 Size is unlimited, large or small. Contractors may order one (1) piece or fifty (50) pieces all custom sized to suit their applications. DuraFence Banners can be manufactured with pole sleeves, hook n loop (velcro), eyelet grommets and specialized features custom to your needs. 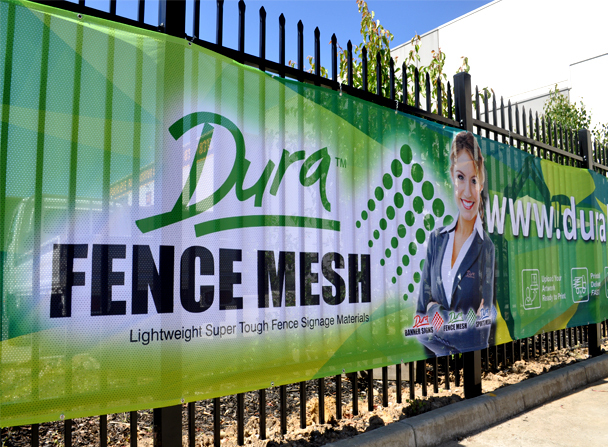 DuraFence mesh is suitable for construction sites and can be resued for multiple jobs.